From Albuquerque or Santa Fe: Take I-25 to Tramway (Hwy 556). Turn West on Tramway, continue to the round-about. Take Hwy 313 North, approximately 1 mile, past Shady Lakes, to Sandia Lakes Recreation Area on the left side of the road. From Rio Rancho, or the West side of Albuquerque: Take Alameda to 2nd Street (Hwy 47), turn North on 2nd Street. Continue on 2nd Street past the merger of 2nd and 4th Street; this becomes Hwy 556. Continue to the round-about. Take Hwy 313 North, approximately 1 mile, past Shady Lakes, to Sandia Lakes Recreation Area, on the left side of the road. From Bernalillo: Take Hwy 313 South approximately 7 miles to Sandia Lakes Recreation Area on the right side of the road. "Discover Paddling" Every Wednesday at Sandia Lakes Recreation Area! Come join us for a variety of fun skills building games, socialization and practice. Ideal for NMKI students who want to practice or tune up, meet others or play fun games. We especially invite families to join us during this time. Beginners Welcome! This is a great place to start out or try kayaking for the first time! NMKI students welcome! This is a great place to tune up or practice skills you've learned and meet others in the paddling community! SUPs Welcome! Great place to practice, or exercise! Kids & Families Welcome! 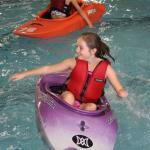 Introduce your kids to kayaking in an informal, yet controlled environment. Get them hooked on the outdoors at this amazing recreatin area! Touring kayaks Welcome! Unlike the pool, Sandia Lakes has plenty of space for touring kayaks. Practice rescues, strokes and maneuvers to fine-tune your boat control skills! There's no official theme for this month; the only requirement is that you come out and kayak with us! 5:20 - 5:30pm; Arrive at Sandia Lakes, meet NMKI representative and pay user fees before entering the park. After park entry fees have been collected, drive to designated lake (typically #3) and meet NMKI representative to gather assigned gear. 4 total bathrooms are near by for changing (2 mens, 2 womens). Do not change in the parking lot. 8:00; Gates lock. All paddlers must be out of the locked area by 8pm. Park in the designated parking lots; those unloading boats may park nearer to the access point, provided they do not block access to the road or additional parking. Kayakers are not permitted in the lakes before 5:30pm. Please wait outside of the gated area until Jane or other NMKI representative collects your entry fee between 5:20 - 5:30. If arriving after 6pm, Sandia Lakes will not open the gates; you will be expected to carry your boat from the store parking lot to the lake for kayaking. Best to arrive well before 6pm. All others - $5 for the first two trial sessions; $15 after that. If you requested a boat, you must arrive by 5:30pm to pay the park entry and gear rental fee, and get your gear by 5:45. Otherwise, all unclaimed gear will be locked down for security for the remainder of the night; no exceptions. Private instruction is available upon request. $85/person for a 2hr lesson, pre-paid. May include up to two people. $3 per person (park entry fee for observers only). This applies to anyone who enters the recreation area, including kids. These options are typically not "current model" kayaks, but typically range from 2007 - 2011 year models. These options are considered "current model" kayaks and are typically less than 2 years old. I like the emphasis on kayaking as a positive experience. After taking the classes, you realize that you can have a very fun time, even before mastering the roll. Other classes I've taken make the roll seem like a necessity, and learning to roll (or not), becomes the focus, which eclipses the fun of kayaking. I would wholeheartedly recommend this course. My girls had a blast and I thought the price was a bargain. My girls are young enough, so almost any activity is still "fresh" for them…they are up for about anything. The girls had a blast - they really enjoyed this.